Grab a friend and make room on the couch! PlayStation Store’s Co-op Sale offers discounts of up to 60% on games and movies best enjoyed with company. PlayStation Plus members save up to 70%. Starting now, save big on multiplayer titles including Dark Souls III, Diablo III: Reaper of Souls – Ultimate Evil Edition, and The Division. But that’s not all, PlayStation Store offers deep discounts on movies such as The Hangover, Grown Ups, and Back to the Future – over 100 in total! Check out the full lineup below, but don’t wait too long to head over to PlayStation Store. 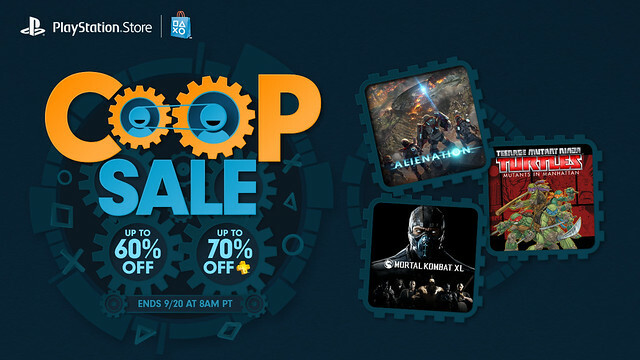 The Co-op Sale ends on Tuesday, September 20 at 8 AM PST. I’m considering buying Alienation for the local co-op, but I won’t be renewing my PS+ subscription. Can anyone tell me if I’ll be able to play couch co-op with a friend, on their PS4, using my profile, if I don’t have PS+? In other words, if I don’t have PS+, will I be able to log-in using my online profile to play local co-op at a friend’s house? I’m almost positive you don’t need PS Plus to play local coop at a friends house, even if you are using your profile. @Vegeta: Thanks for your answer! Hopefully I can get a more certain reply, but I appreciate your input. Plus isn’t required to sign-in online. You just wouldn’t be able to play online, but local is fine even if your signing into another system. I can not think of a single local-co-op game that requires plus. Helldivers for example you can play online, but no need for plus to play co-op on the couch. So there is no game that you should ever have to worry about couch co-op. You may not be able to play with a 3rd friend online and may have to invite him to come over so you can all play, but there would be outrage and I’m 95% sure that someone would have told me if there was a game that blocked local-co-op without PS Plus. Why? Cause I argue with PC Master Racers a lot and those people will drag up the most petty, benign stuff, just to justify however many thousands they spent on their rig. I was just talking to a friend about finding a game to play together. We just picked up Diablo 3 and I’m also considering getting Lovers in a Dangerous Spacetime. Would’ve loved to see Overcooked for sale though! Have been waiting for a sale on Senran Kagura Estival Versus on Vita! Played Shinovi on Vita and decided to get the physical release of Estival on PS4 first. Will have to find $24 somewhere. If you haven’t played a Senran Kagura title on a Sony system, don’t hesitate to take advantage of this sale!!! I preordered batman return to arkham and didn’t get the theme. Anyone else have this problem? Every time I click on weekly deals on the web store, it gives me a timed out error. Is anyone else experiencing that problem? Try logging out and logging back in? Though though I guess a PG use for it is troubleshooting problems, and sometimes I use it to look up things I MIGHT want to get my wife, but without leaving a trace that I’m looking at Miyazaki films to buy her. But anyway enough of my rambling I guess, try one of those modes, see if it works. If not, try a web browser you never use. then try it in that mode, if none of that works… go to the contact us for Sony and see what customer service can do. 3rd Strike Online isn’t showing up at its discounted price on PSN. People want better graphics, and there’s only so many graphical features you can push when you have to be able to render 2-4 completely different renderings. There are still games where you can have couch matches, including screen cheat which is based around the idea of people cheating by looking at everyone elses screen XD. You probably don’t care about Skylanders. Though that has co-op and racing co-op. The current and next one support racing. Diablo 3 supports same couch co-op though when you pull up the Options menu, it does not really leave you with room to continue playing while your friend piddles around trying to get a few digits to go up on their DPS calculations. Some of that is alleviated with pressing the up button and I think triangle to equip if you see ^^^ 3 up arrows. Know anyone who bought the PS3/4 Humble Bundle? lol. Redbox you can rent it from, Gamefly probably has it, and it’s like $40 on Amazon, or Target and Best Buy will price match Amazon. Definitely recommend Alienation. The effects are amazing! Dead Nation is another great co-op game. PSV game discount is not very much like, because I also like PSV platform game. Sony y’all need to try harder on those PS4 sales…just saying. i agree batman arkham night is the only real game that has some promise on this sale yet they make you pay over $20 for the premium and over $10 for the regular edition if you guys are going to do a sale make the prices by $10’s or under that amount of money otherwise your wasting our times this game came out in the early spring of 2015 its been almost a full year and you can’t give your custumers some form of value for being a ps plus member. Wish they would have a Sale on the Season passes for Street Fighter V, i bought the collectors edition with the figurines etc… and it doesn’t come with the season pass, which looking back, is a complete rip off considering how much we paid initially. I’m considering Mortal Kombat XL at half price…. Odd that neither Helldivers nor Gauntlet are included in co-op sale when they are among the best co-op games you can get for PlayStation. It should also have those PixelJunk games on sale. Hi Sir, When do you think Assassin’s Creed Unity will be on sale on PS4? I hope soon, thank you so much. hi guys! what do you recommend me to buy for my ps3? i have bought dark souls 2 and guacamolee! do you guys think i miss something? thanks!